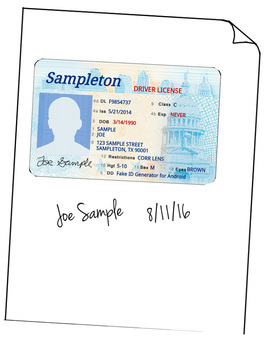 Gather your government issued ID, such as a driver license or passport. Sign/date a plain piece of paper and place the ID above this signature/date. Either scan, take a digital photo of, or make a copy of this ID/signature. *If faxing, make sure to lighten a copy and enlarge before faxing. Email is the best way to send documents. Often, the easiest way to do this is by taking a picture of the ID/signature/date with a smart phone and emailing it from the smart phone. If you have questions or need anything, please email us at support@superfileinc.com.